Another deadline met! July is the Thimble Pleasures guild’s challenge reveal. This years challenge was “Heritage”. I combined several ideas to create mine. I started with my quilting history and did hand appliqué, hand quilting, and used one of my favorite designer’s patterns as a jumping off point. The pattern I choose is one by Lori Smith of “From my heart to your hands”. I fell in love with her style years ago! Every so often, I find a design I just have to have. 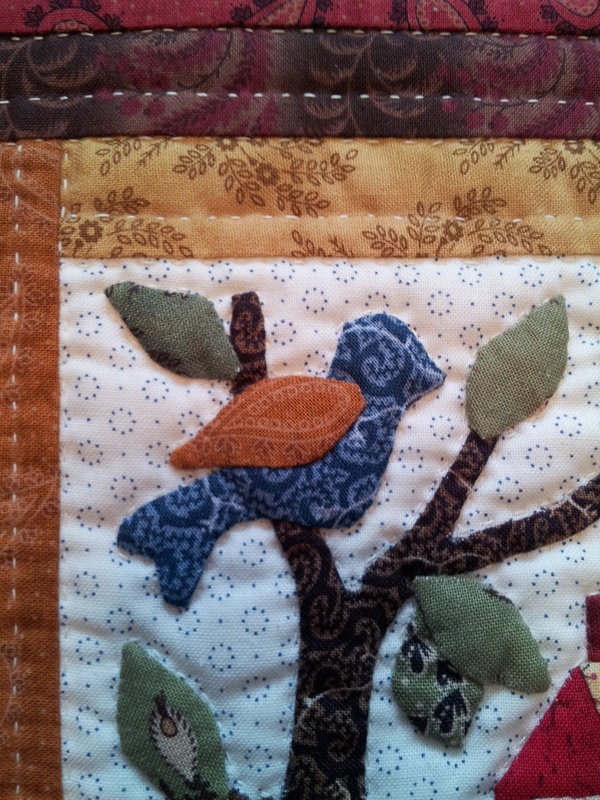 I used one of her small quilts from “Quilt Squares #5” as my inspiration and pattern for parts of my piece. I couldn’t pick just one nationality of my ancestors! I’m a bit Welsh, Irish, English and German (and probably some others). So, I used the logs of the log cabin surround to show how many different pieces/nationalities come together to become a wonderful whole! The tree represent my family tree and strength of family ties. The blue bird is often a symbol for happiness. I changed the house to a schoolhouse as I am from a family of teachers going back several generations! I have always said teaching is in my blood! Teaching is my passion and teaching quilting makes me very happy. I enjoyed every step of this project. As I came to different steps, my quilting mentors and friends were whispering tips and memories in my ear. 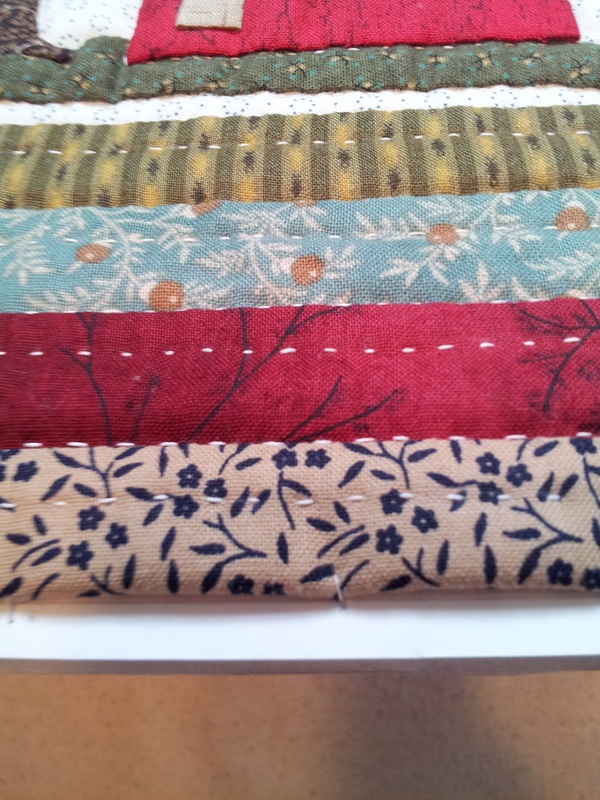 I dug through my stash for just the right fabrics to make me smile. I have always been a fan of freezer paper appliqué , but I did some back basting (shown to me a few years ago by my friend Kathy H.). 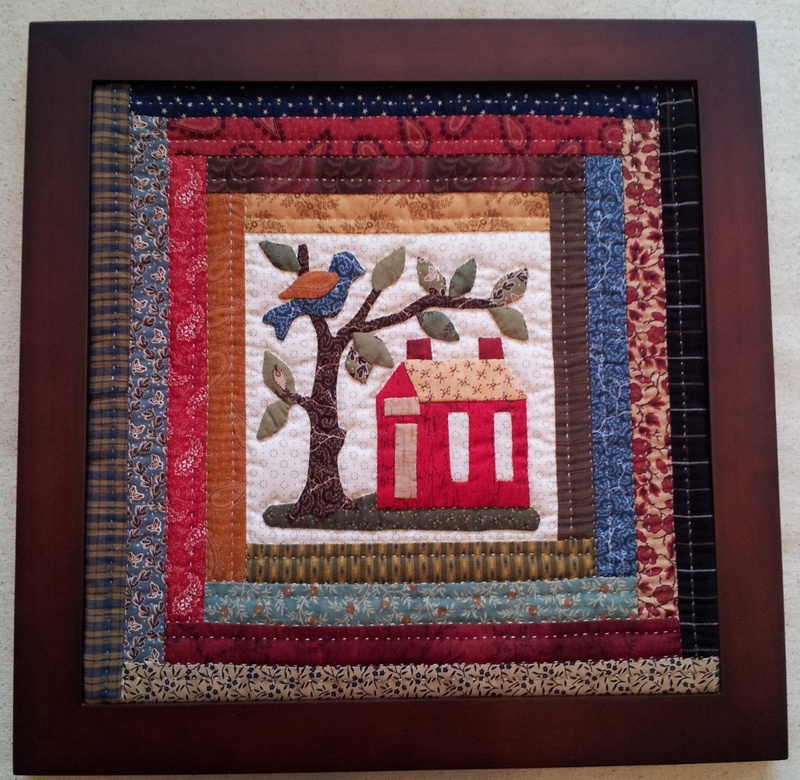 I did some reverse appliqué for the schoolhouse windows to give it the feel of looking into the schoolhouse. I thought about putting a school name on the sign but decided to leave it blank so it could represent any of the many schools my family and I have taught at and attended. (Bueker Middle School in Marshall, MO is named for my Great Uncle Armin…how cool is that!?!). I even hand quilted it. 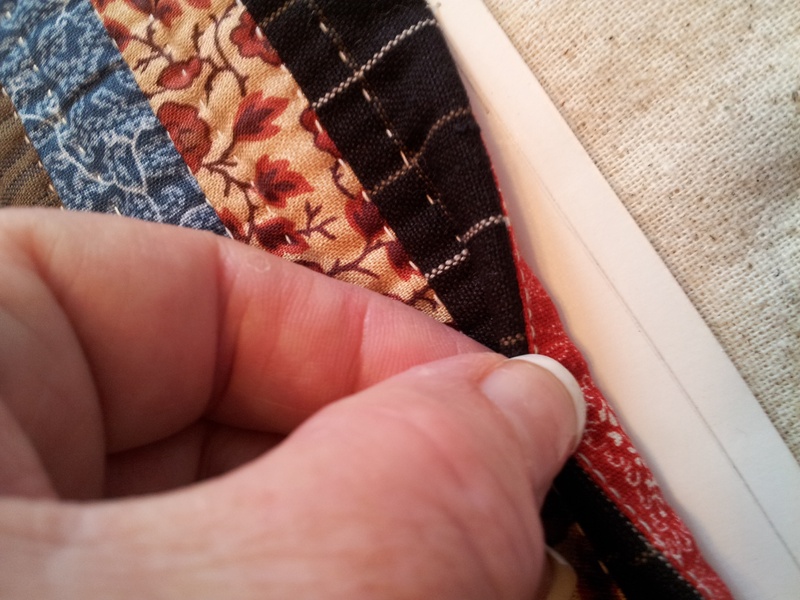 I tend to go in high gear most of the time, it felt good to slow down and enjoy the needle and thread in my hand. To add to the heritage part of all of this. I spent some time with both my parents looking at their family trees/charts, paperwork, land grants and certificates. Amazing to think about all the history that got us to this point in time! #1 – Use the designs in your fabric to enhance appliqué pieces. This piece is a 12″ square, so a 12″ square worked beautifully. I did not want the bulk of a traditional binding so I applied a single fold binding to the front and pulled it all the way around to the back. I also stitched the entire piece onto foam core board to keep it flat and secure in the frame. 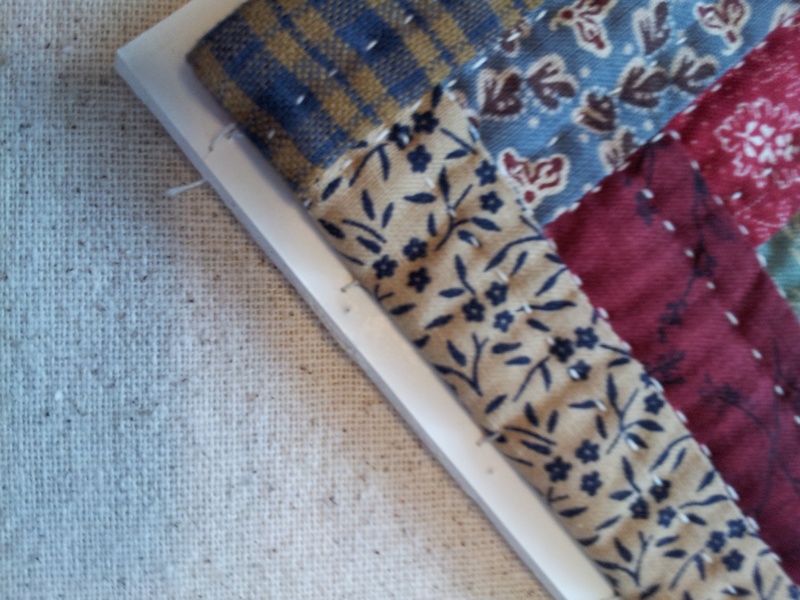 This entry was posted in Brilliant Bindings, Handwork, Quilting, Tips, Uncategorized. Bookmark the permalink. Love your windows on the school plus a history of family teaching.